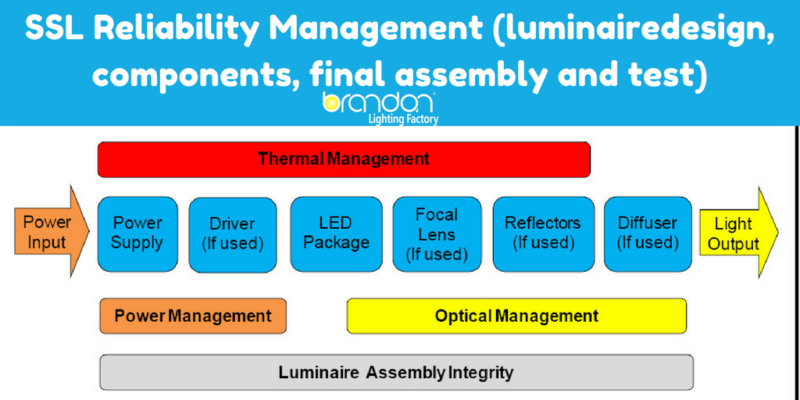 Failures within an SSL luminaire often stem from at least one of four functional aspects of luminaire design and manufacturing: power management, thermal management, optical management, and luminaire assembly integrity. Figure 2 provides an overview of a contemporary SSL luminaire and the relationships between the various components and materials and design elements. Design goals and reliability impacts for each of these four functional aspects are described below. -Power Management – ensuring the power delivered to the LED package(s) is appropriately sized and filtered. o Design Goals: For proper operation, the power supply and related electronics must provide a well-controlled and protected (from electrical transients) drive current and possibly other control and monitoring features, and must be designed to properly function for the anticipated life of the product. o Reliability Impact: Component failures due to improperly designed and executed power management may often result in a catastrophic failure of the luminaire, but they can also cause less obvious effects, such as reduced light output or flicker. Proper power management includes protection against failure caused by electrical transients. This protection might be built into the driver or might be a separate subsystem of the luminaire. -Thermal Management – ensuring that heat generated by the LED package(s) and the power system components is removed to minimize LED temperatures so as to maximize LED performance and lifetime. o Design Goals: A reliable heat-conducting design, be it passive or active, is required to remove heat from the LED package and luminaire, and phosphor, if applicable. The design should assure that the LED package operates below a manufacturer-reported LM-80 measurement temperature to achieve the desired lumen maintenance of the fixture (an ENERGY STAR® requirement). Also, the design must assure that temperatures for other devices (power supply, control circuitry, optical components, etc.) do not exceed the manufacturer’s specified limits. o Reliability Impact: Improperly designed and executed thermal management will usually result in accelerated lumen depreciation and potentially degraded color quality or color shift of the LED package(s). -Optical Management – ensuring that light output from the LED package(s) is correctly and efficiently shaped and directed toward the desired surface. o Design Goals: Component choices and manufacturing methods should be chosen so that the optical materials retain their integrity throughout the life of the product; it is desirable that such components not be life-determining. o Reliability Impact: Optical component failures may degrade lumen output of the luminaire’s LED package(s) or, because of discoloring, may also result in a color shift, but rarely result in catastrophic failure. -Assembly Integrity – ensuring that the overall housing design and assembly process(es) provide for sufficient long-term protection from dust, moisture, vibration, and other adverse environmental effects. o Design Goals: Luminaire housing design and materials must be designed to offer sufficient protection for the LEDs depending on the anticipated environment. Repairable designs should allow simple field replacement of any failed components without degrading the integrity of the housing or other components. Even if the SSL luminaire is well designed to address all of the various failure modes, attention to proper manufacturing steps and quality process controls must be clearly documented and carefully executed. Any of the failure mechanisms inherent in electronic assemblies and other luminaire components may apply to an SSL luminaire.